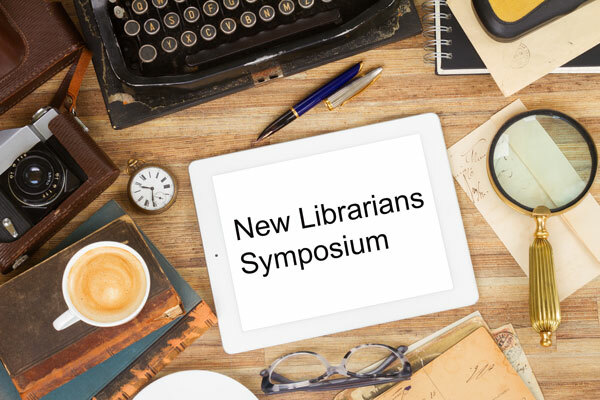 The genesis of the New Librarians Symposium happened—as all decisions to hold a brand new, medium-size event do—after a conversation. The two of us—a Scholarly Communication Librarian and a User Experience Librarian—were a few weeks into our positions at the University of Guelph, and we both felt like we were in a bit over our heads. We shared concerns over mentorship, communities of practice, and professional development before realizing that we were quite fortunate in this respect. As academic librarians, we have a robust, active community of practice, as well as access to professional development funds and opportunities. We realized that solo librarians, those working in small or rural organizations, or folks in non-traditional roles would likely have a hard time connecting with other new librarians. Recognizing that there currently was not anything that brought early career professionals together, we thought we should try our hand at organizing an event. After all, who better to organize an event for new professionals than new professionals themselves? We were well-positioned to do so, given that we were both at the same career stage at the same institution. The point of NLS was not to be a didactic or “how to” event focused around securing a job or learning a skill. This differentiated it from other events catering to new professionals. The purpose of NLS was for new professionals to connect with each other, develop their networks, explore potential collaborations, and ultimately, to learn together. This ethos clearly resonated with participants. Attendees chose to attend the event because they viewed it as being “good for relationship building” and “geared towards people like me.” They remarked that they found the programming “really great” with “a lot of variety,” and that they appreciated the diversity of perspectives represented. These principles factored into all of our decisions, from speaker selection to local arrangements to devoting one third of the program to attendee-generated questions and commentary. We defined “new” as anyone who had been working in the field for three years or less post-graduation. Although the word librarian was prominent in the event’s title, it was meant for early career professionals in the information science field more generally. 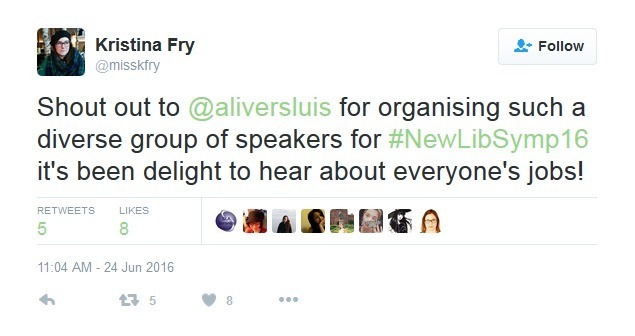 We also wanted to keep the event free because attracting the most diverse group of voices was a priority. We were successful in securing sponsorship contributions from the University of Guelph and Ryerson University libraries which allowed us to pay for some coffee and host the event in a centralized, accessible location. Though we realized the Toronto-centric nature of our decision, we thought that this was appropriate considering the proximity of three LIS schools, as well as the plethora of new professionals working in varied settings. As we offered some travel bursaries, we felt that Toronto would be the easiest location to get to in terms of logistics. We were intentional about having our program reflect the diversity of roles in the information science profession, so we reached out to folks working in varied roles to participate in our Lightning Talks. These talks were intended to be “A Day in the Life” snapshot that articulated what prospect researchers, legal librarians, and scrum masters actually do. Attendees appreciated the wide diversity of roles available to LIS graduates, and it was an invaluable perspective for those who had recently graduated or were currently involved in contract work. It also helped illuminate the responsibilities, struggles, and triumphs of colleagues across the profession, providing context outside the silos. The centrepiece of our program was a panel on leadership. Recognizing that leadership is not always synonymous with management, we invited speakers who embodied the spectrum of leadership. We urged them to shy away from conversations about “how to be a leader,” and instead encouraged them to reflect on their journey, what they’ve learned, and all that leadership can entail. The ensuing discussions about power relations, imposter syndrome, privilege, balance, and collaboration were well-received, revealing that there is an appetite for critical perspectives on some of our profession’s larger discourses. Two Birds of a Feather sessions closed out the day. We thought it would give attendees the chance to reflect on the ideas raised throughout the day. Topics included special projects, skill development, mentorship, LIS education, and issues in the profession. This was an opportunity for attendees to connect with their peers in an unstructured way and generate some commentary on issues of importance. Precisely because we had the intention to pitch an OLA Super Conference presentation on ways that the LIS community can better support its new professionals, we saw these suggestions, criticisms, and solutions as the foundation for that research. To find out more about NLS, including an overview of the program and invited speakers, check out the event website.